Call A to Z Entertainment, Inc. today for free information about how to hire or book country music singers the Swon Brothers. Having helped hundreds of clients, we are your best agency and agent booking and hiring The Swon Brothers! We book or help you hire any live professional entertainment you want, to include live country music singers, bands, and country musicians. We can also help you plan and produce your event or show. So call us today at 888-655-4575 and we’ll be happy to help you. 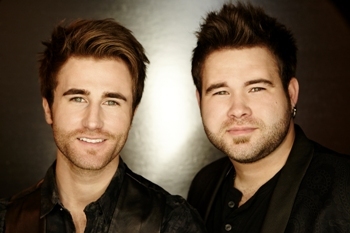 The Swon Brothers, Zach and Colton Swon remember their first performance in Nashville like it was yesterday. It wasn’t in a packed house during a writers’ night on a dimly-lit stage, or in the office of a publisher who was eager to hear their latest songs. It was actually a “pit stop” on the way to a family vacation in Florida. Of course, they were only 9 and 11 years old at the time, but to them, it was perfectly normal. After all, they’d practically grown up riding their parents’ tour bus and performing as part of their family’s gospel group since they were old enough to talk. So stopping off in Nashville to pick up a record deal on their way to summer vacation just seemed logical to young Zach and his little brother Colton. And… their parents weren’t about to dampen the spirits of their talented and determined young sons. The Swon Brothers didn’t land a record deal the day they sheepishly walked into the lobby of a certain major record label and asked the receptionist if they could please sing for someone, but they did make such an impression on the president of the label that the three struck up a professional relationship. That single-mindedness of purpose and laser-focused determination to make their music the best it can possibly be has never wavered for either of these hardworking Oklahoma boys, who are poised and ready to share their own unique brand of heartfelt country music with the world. The Swon Brothers‘ show at the Civic Center in Wagoner became very popular and soon they were filling the building to capacity as fans packed in week after week to watch them entertain. After building quite a following, Zach and Colton decided to begin playing as a duo and focused even more on their songwriting. Both have been writing since they were very young and now they return to Nashville on a regular basis to co-write. They actually have their first trip to Music City documented on tape — not that they could ever forget that fateful day when they first became hopelessly enchanted with Nashville and its country music scene. “Our parents drove us around to every label in town that day,” recalls Zach. “They knew it wasn’t gonna happen, but they filmed it and watched us walk in and walk right back out, and they’re actually laughing at us on camera — you can see the camera start shaking because they’re laughing so hard at us walking out with our guitars, you know. And we’re seriously disappointed because we thought that’s how you do it… you just walk in, sing good and a get a record deal,” laughs Zach. “We finally made our last stop. We had gotten kicked out of so many labels and it was so disappointing. It’s hard for me to take no for an answer,” adds Colton, “so of course that final label said no and we got back in the car. That was our last stop before Florida so my dad said, ‘If you really want to sing for somebody, just go in there and sing for the receptionist… I bet you won’t.’ And that was the wrong thing to say to me! I took it as a challenge! So Zach stayed in the car and I went in, I couldn’t even see over the counter, I was probably 8 or 9 years old, and I was a little guy anyway. I said to the receptionist, ‘Look, we’re really tired of getting told no… could we please sing for you?’ So she said, ‘Sure, it won’t get you anywhere, but you can sing for me.’ So I went out and got my brother, who was hiding in the car. We both went back in and started singing an Everly Brothers song. While we were singing for the receptionist, the president of the label came down the staircase in the lobby from a meeting and stopped to listen to us. He told us to keep up the good work and then gave us a tour of the record label and some free CDs. He’s been a good friend ever since. The Swon Brothers were recently finalists on NBC’s “The Voice” on team Blake. Prior to their “Voice” experience however, The Swon Brothers spent years performing and recording music on their own label which have been well-received among their ever-growing fan base. Songs like the irresistibly catchy “Oklahoma Lovin’” and the bluesy, soulful, “This Close To Gone,” not only show off their diverse vocal strengths, but also their ability to write gripping lyrics that resonate with audiences from young to old. We’re your best agency and agent booking and hiring country music singers The Swon Brothers, so call 888-655-4575 today! With over twenty years of successful experience, we can help you book or hire any live country music singers, musicians, and country bands. We are not the exclusive agency for any live entertainers on this site.